"Full-featured web browser based on Chromium"
Google Chrome, Internet Explorer and Mozilla Firefox are nowadays the most popular web browsers. However, there are some nice alternatives that are worth trying, and the following program is one of them. Comodo Dragon is as fast and reliable web browser based on Chromium's source code, just like Google Chrome, but focused on security. Comodo Dragon was designed to be fast and easy-to-use. And to provide a safe internet browsing experience. 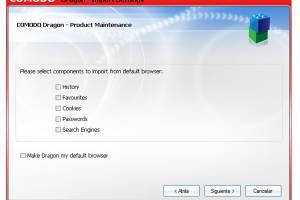 Comodo Dragon features a simple and user-friendly interface, very similar in appearance to Google Chrome. However, the good stuff is under the hood. Comodo Dragon implements many security features and enhancements not present in Chrome or Chromium. For example, it features the advanced Domain Validation technology that automatically segregates superior and inferior SSL certificates, it can stop cookies and trackers, and a lot more.